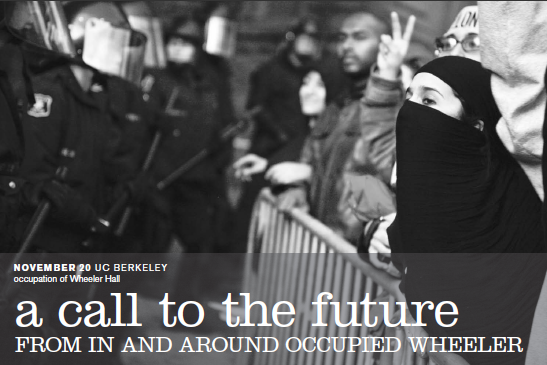 On Friday, Nov. 20th a brilliant revelation appeared on UC Berkeley campus. Students and workers on this campus held true to their aging chants and actually stood up and fought back. Mocking the days preceding where apathy seemed to reign on campus, when we forced ourselves to mutter “Whose University? Our University,” while shuffling along and doing our duty as concerned citizens, for once, in and around occupied Wheeler we really meant it. The fight inside Wheeler Hall by the occupiers in order to win their four demands translated into an incredible show of solidarity outside the building. We linked arms with once strangers, surrounded all exits and went as far as to build barricades two buildings away, to prevent the imprisonment of our friends via underground passageways. For 12 hours we shone light on a new horizon in this struggle. The occupiers inside were fighting for us and we were outside fighting for them and for the first time in decades thousands on our campus stood together taking direct action, not passively listening to speakers at a rally and not marching in circles. The spontaneous organization outside of Wheeler has been criticized for being exactly that, but here we would like to commend it. We saw lines be redistributed to maintain three-deep levels, people dispatching themselves to watch-out for police movements and to bring food and water to those at the barricades. The words “solidarity” and “democracy” have been thrown around and emptied out for far too long. At the Wheeler Occupation we put action back into solidarity and we voted with our raised fists not with raised hands. Ultimately, while we did not win any of the four demands from inside of the occupation, the demand from the multitudes outside was victorious as our friends emerged from the building without cuffs to join us. Of course the police responded, but we need to make one thing clear: at the Wheeler Occupation we were not victims. Yes we had our fingers smashed and yes we did survive the police batons and rubber bullets but more importantly we stood our ground and did not back down. We provided a glimpse of what is possible when we are united in action and not divided by sectarianism of ideology or rank. Speaking of sectarianism, at the Wheeler Occupation there were a considerable number of the Cal faculty and others on the higher levels of the university food chain who stood shoulder to shoulder with us and they must be commended for their courage. On the other hand some of the more prominent figures continued to enforce their authority and attempted to talk the occupiers inside into surrendering and those outside into sitting down or leaving. To these faculty, officials in the student government and student organizers we ask that you shed these positions of power and join us horizontally the next time we take action. Some have criticized our actions on the grounds of depriving students of their sacred class time. Let’s not pretend that education is about robotically copying equations from the blackboard or regurgitating facts on the midterm or final. While this atomized education might have been disrupted for one day, a collective learning experience, far more educational in all respects, was provided to all at Berkeley. This is something to cherish and further, not to shun. In struggling together we learn deeper than in any classroom curriculum. November 20th was a learning experience in how effective we can be if we stand together. We are not looking for a return to the status quo before this latest financial crisis. The privatization of the university did not start over the summer, it has been implemented for decades and this latest crisis is seen as an opportunity for its furtherance. Although the defunding of public education must be challenged, appeals to Sacramento for more cash will not reverse the activities of the current and past corrupt administrations. Nor will it abolish the prison industrial complex, which stands in stark contrast to public education in terms of funding. There is a deep systemic problem that goes farther than UC Berkeley. Austerity measures of the kind being implemented on this campus are also implemented by the state and federal government and thus the struggle must be expanded beyond the university. But from our immediate position, as long as we don’t subvert the current power structure in the UC system, more state funding will mean more privatization, higher wage differentials and the increased financialization of our futures. We are calling for more bold direct actions that continue to escalate the struggle and reclaim the university not for what it once was but for what it might actually become. Start organizing with each other, disrupt the zombie routine on campus, it’s time to rise from the dead. Thank you to everyone who fought on November 20th. See you on the barricades next time. This call comes from a diverse group of numerous UC students and faculty who have been involved in planning direct actions and occupations on the UC Berkeley campus.